Obonok Technologies has begun to ship an advanced model called the Blu- Wire RD3-XP transceiver. A product extension of the current Blu-Wire RD3, the RD3-XP version adds an important new feature — automatic skew compensation. Obonok incorporates automatic skew compensation into HDMIover- UTP signal distribution and extension products. The benefit to the user is the ability to daisy-chain, or link, up to ten receivers together, enabling far greater extension distances, over a wider variety of Cat-7/6e/6/5e cables. The Blu-Wire RD3-XP Transceiver also features three HDMI outputs, meaning that three HDTVs can be connected to one unit, reducing the equipment needed for a given application. Mohawk has announced the release of the indoor/outdoor version of Spectrum low-skew video twisted pair cable. This product begins with Mohawk’s Spectrum design of four twisted pairs under one jacket. This is a great alternative to coax for RGB video applications or component-style video broadcasts. The product is then enhanced with a water-blocked design and a black sunlight- resistant jacket. 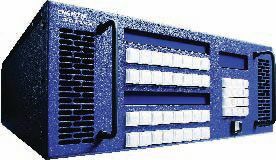 Spectrum I/O was designed for applications that run from inside a building to outside locations. It can be installed in flood-prone indoor locations or outdoor duct locations where standard plenum or riser-rated cables fail. X2O Media has introduced the X2O data service. The new service offering provides digital signage users with a wide variety of live feeds, including convenient bundles of the most popular data feeds, premium data feeds, and additional data content available á la carte. When used with X2O’s Xpresenter platform, the realtime feeds automatically update displays, minimizing the effort and cost required to keep content fresh and relevant. The X2O data service features bundles of the most popular live data feeds — news, weather, sports, and business headlines — at competitive rates. Business data feeds include individual stock quotes, market index values, and currency values. Tek Panel’s Tek Panel 420 is the first Tek Panel product designed with digital signage in mind as the primary function of the system. Featuring a 42-inch TFT/LCD display in addition to a fullpowered, upgradeable, integrated PC, the Tek Panel 420 has a slim bezel and options such as built-in touch screen and internal stereo speakers. Its all-aluminum enclosure, along with various ruggedization options such as optically bonded displays, make it the ideal all-in-one interactive digital signage system for public display. SunBriteTV’s 3220HD-TS is a 32-inch all-weather, touchscreen display designed for outdoor commercial installations where interactivity can be used for directories, promotions, advertising, and education. The 32-inch LCD HD screen on the 3220HDTS displays a bright 1366- x 768-pixel image with 1500:1 contrast ratio. Built into the exterior, in front of the LCD screen, is the all-weather interactive touchscreen that is available using either Surface Acoustic Wave technology or Dispersive Signal technology. The filtered airflow system within the unit keeps the monitor cool in temperatures up to 122 degrees F.
Canon has expanded its notable line of LCD multimedia projectors with a native WXGA-resolution widescreen model, a 3000-lumen XGA model and a 3500-lumen XGA model. The new Canon LV-8300 multimedia projector provides a native WXGA-resolution and aspect ratio of 16:10, which allows it to support data and imagery from widescreen notebooks and desktop computers. As a result of the projector’s native widescreen format, this model supports popular WXGA-resolution computers in their native format, avoiding the need for compression and/or unsightly distortion. Extron Electronics' CVC 300 is a new universal, high definition component video to RGB converter. It accepts all standard definition and high definition analog component video formats, from 480i and 576i to HDTV 1080p/60 and 1920x1200, and transcodes the incoming component video signal for output as RGBHV or RGBS. The CVC 300 is ideal for use in applications that require the integration of devices with component video output into RGB-based AV system designs. The CVC 300 supports interlaced or progressive scan video with bi-level or trilevel sync, detecting and maintaining the relative timing of sync signals during the component video to RGB conversion process. Black Box Corporation has announced a new family of browserbased, networked digital signage media players and appliances designed to simplify the layout and distribution of professionalcaliber content. Designed for standalone or multisite applications, Black Box's iCOMPEL appliances make it easy to assemble and manage HD-quality digital signage content. Digital signage can be used to increase sales and improve communications, as well as alert, inform, and notify a target audience. The system can be used by companies of all sizes, but it should be particularly suited to small- to mid-sized businesses looking for an affordable, out-of-the-box solution. Samsung Electronics has begun mass-producing a more economical line of digital information displays for indoor applications, where round-the-clock use isn’t needed. Unlike traditional TVs, the displays are designed to be mounted in either landscape or portrait configurations. The new Samsung line is available in 32-inch, 40-inch, 46-inch, and 52-inch sizes, and comes with an 18-month warranty. Boasting a contrast ratio of between 3000:1 and 4000:1, the new line makes use of liquid crystal technology better than that used today for digital televisions. The advanced technology makes the displays more reliable for extended use, and its heat-resistant characteristics permit better heat management. IBASE Technology has announced the release of the SI-24S Signature Book — an ultra slim embedded system tailored for digital signage applications. The SI-24S combines the graphics performance of a discrete ATi E2400 GPU with 128 MB of dedicated GDDR3 video memory and the efficient computing resources of an AMD64-based 1.5GHz Sempron 210U-embedded CPU. It is able to support dual 1080p independent displays with VGA, DVI, or HDMI interfaces. The Signature Book can be wall mounted or used on a desktop. It features dual DVI-I outputs, Quad USB 2.0 ports, built-in Gigabit Ethernet, and audio outputs. An integrated 802.11n WiFi or NTSC/ATSC TV Tuner is optional. Digital Projection International now offers an advanced Warp and Blend system to complement their full range of precision displays. The Mercator III represents the pinnacle of precise, low-latency image warp and blend technology. The Mercator III is a modular, rack mounted solution that can be ordered in standard configurations to support from two to 16 display channels. Applications with more than 16 channels can also be addressed on a custom quotation basis. It has extensive blend capabilities, including gamma finetuning and black level offset in non-blend areas. Exhibio has announced the release of updated software version 3.2 for both the X-series and M-series solutions. Several new additions make the Exhibio Manager more intuitive to current uses for displaying content. The web application user interface has been completely redesigned for quicker and more intuitive interaction. A new section has been added to centralize important statistics and metrics. Timeline and Month View modes have been added to the Scheduler. Day and Week Views have also been improved. The Media item button now allows for creating and displaying scrolling text areas within each page. AvaLAN Wireless Systems announces the new AW900xTP and the new AW5800xTP ultra long range wireless Ethernet solutions. The new products combine a unique set of features that make them ideal to deliver content to outdoor digital signs. An AvaLAN radio pair can bridge a 30-mile distance without sacrificing bandwidth, security, or performance. The AW900xTP and AW5800xTP products enable Ethernet connectivity for fringe IP devices, including digital signage media players or digital billboard surveillance cameras. AvaLAN products are an ideal replacement for installations where WiFi systems are under-performing or failing completely due to insufficient range, excessive interference, or unsatisfactory reliability. Westinghouse Digital Electronics now offers businesses three unique outof- home (OOH) digital signage solutions. Westinghouse’s turnkey signage solutions provide a highly targeted and more cost-effective way for companies to reach customers on the go with ads, information, and entertainment. The new offerings include a hardware-only based PumpTop Topper, a selfadministered NeonPump solution that adds neonSource and neonNow software to the PumpTop Topper, and a complete managed OOH solution that features the PumpTop Topper with an integrated media player and content management provided by its strategic business partner, AdtekMedia. FogScreen will be launching their new FogScreen projection screen R-series. This new product series is aimed at the retail and digital signage sectors. FogScreen’s R-series product provides retailers and digital signage providers with the ultimate projection screen for attracting and holding the attention of consumers. Not only does this new FogScreen projection screen allow shoppers to walk-through and physically interact with videos and logos moisture-free, but it can also be configured as a touchscreen where high-impact images literally float in the air.